The game has four classes (fighter, magician, cleric, thief) and 18 subclasses. My opinion here is that subclasses were a bad idea in AD&D and they haven't gotten any better over the years. As soon as you print "Many barbarians are exceptional horsemen ... From the saddle of a tamed mount he can fight with melee weapons and discharge missiles," you needlessly bar other classes from fighting from horseback. When you print that an assassin can "fashion a facade that simulates a particular social class, possibly making one appear a few inches taller or shorter, and/or several pounds heavier or thinner," you beg the question of whether no one else is capable of putting on a beggar's rags, stuffing in some padding, and walking with a stoop. The subclasses in AS&SH are quite well done, as such things go, but they're still emblematic of aping purely for the sake of aping. I'd rather see the subclasses dumped and their special abilities treated as talents that characters of the four main classes can learn as they choose. If you like subclasses, then you'll probably be pleased with the way they're handled in AS&SH. The combat sequence is detailed, with interwoven phases that make combat tactically richer. The cost is a big loss in speed. This much granularity is a good learning tool for people accustomed to individual initiative but new to side initiative. Once GMs and players get the hang of Igo-Hugo sequencing, this level of detail becomes a distraction more than a help. I suspect most groups will shelve it after a few sessions. In short, if you played 1st or 2nd edition AD&D, almost everything in AS&SH will be familiar. So familiar that if you don't read these books carefully, you'll fall into old habits and play AS&SH "wrong." But then, everyone played AD&D "wrong," too, and it didn't matter, so it's nothing to stress over. The bestiary is exactly what you expect except for the addition of monsters from Lovecraft: mi-go, shoggoths, the Great Race, deep ones, and many others put in appearances. There are no sanity checks or insanity rules. Whatever nightmares these creatures inspire is entirely in the players' minds. The magic treasure lists include laser swords, laser crossbows, paralyzing pistols, radium pistols (radiation shotguns, actually, not the radium weapons of Barsoom), and radiation grenades. You'll also find the Glaive from the movie Krull. One hopes its inclusion is ironic, though I've heard that film has a fan or two tucked away somewhere, awaiting the fall of civilization. Hyperborea is why AS&SH exists, I suspect. It's a solid setting for two reasons. The first is that it's a closed world. Everything ends at the edge of the map. The ocean pours off into the Black Gulf, where the Boreal wind howls. The disc of the world isn't exactly flat; it's described as slightly convex, presumably to keep the ocean from just sliding off altogether. The whole map is only about 3,000 miles across, and most of that is ocean. The central landmass is a mere 1,000 by 1,500 miles--about half the size of the contiguous United States--and much of that is wasteland, glaciated mountains, and windswept tundra uninhabitable by all but the hardiest nomads. If you're more accustomed to worlds drawn on the scale of the Forgotten Realms, Hyperborea might seem tiny. Even so, it's more than big enough for any adventure you want. When you factor in the islands in the surrounding sea, both charted and uncharted, you have no excuse for ever running out of adventure sites. Is Hyperborea a fragment of old Earth blown into its own isolated realm? A pocket dimension created by some force or deity? The GM is allowed to provide his own answer for that question or leave it hanging, as suits his whim. Fragment or self-contained world, it sits at its own north pole. North is inward toward the center of the map; south is toward the outer edge all around. This also means west is clockwise and east is counterclockwise, though I didn't see that spelled out anywhere. The sun never rises more than 20 degrees or so above the horizon, and during summer, it never fully sets. During winter, it doesn't rise at all. The seasons, however, are measured in years, not months, on a 13-year cycle. Summer stretches on for over a year of unending daylight; winter brings over a year of unbroken night. When during that cycle you choose to begin your campaign is a very important decision. The rulebook doesn't discuss this at all, but AS&SH would be an excellent candidate for a campaign where months or years are allowed to pass between adventures. Players tend to mistrust inactivity, even when it passes in the blink of an eye. If your players can overcome their suspicion that you're going to pull a fast one on them, beginning each new adventure with "it's been 10 months since you last went adventuring" would be a great way to conduct a Hyperborean campaign. The world would change palpably over the course of the campaign, with distinctly different types of adventures being appropriate to the changing seasons. If your group meets often enough to get through an adventure a month, I'd consider enacting a standard rule that one year of Hyperborean time passes every time you flip to a new month on the calendar in the kitchen. The second reason Hyperborea is fun is simply because it's riddled with interesting places. If you're a fan of swords & sorcery fiction from the heroic age of pulp, then most of these locales will have a good mix of familiarity and strangeness. Hyperborea abounds with mystery, danger, and exoticness. Its history is nicely drawn, and what's even better is that the history presents a solid rationale for why the world has so many ancient, empty, ruined cities and subterranean dungeons. Unfortunately, here's where AS&SH stumbles. On the one hand, we have a wonderfully drawn world where enigmas abound and that pays heavy lip service to the gritty, pulpy, swords & sorcery tales of Howard, Smith, Leiber, Moorcock, et al. On the other hand, we have a well-done retroclone of AD&D with many of that game's rough edges polished smooth. The problem is that AD&D is a poor vehicle for portraying adventures in that world. AD&D is all about collecting: the heaviest armor, the baddest weapon, the deadliest spells, the flashiest magic items. Conan or the Gray Mouser were never defined by their +2 frost brand sword, boots of striding and springing, gauntlets of ogre power, and rope of climbing. No sorcerer of Howard's or Leiber's ever cast a spell like ice storm or haste. When magic spells function like rocket launchers and tasers, wizards turn into soldiers. When the power of magic items outstrips the power of the character wielding those items, the character becomes an adjunct to his gear, a carrier. Both of those styles are characteristic of AD&D (and, by extension, AS&SH), but they're contrary to the pulpy flavor that Hyperborea wants to place front and center. Now, as far as I'm aware, the phrase "low-magic campaign" doesn't appear anywhere in the rules. Having only the printed version of the game and not the PDF, I can't run a search to be 100% sure. 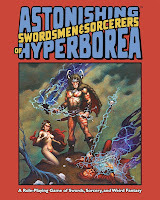 But it does state and restate that the aim of Hyperborea is to capture the spirit of those early fantasy stories from the pages of Weird Tales, and those stories didn't develop anything like a typical AD&D adventure. Could AD&D / AS&SH replicate Weird Tales? Of course they could, but not without either the DM or the publisher of the setting placing severe limits on what's allowed. Rules have profound impact on the underlying assumptions of a game world. In the stories of Howard and Leiber, human freedom, courage, and indomitability are ultimately more powerful than the potent but decadent force of civilization and its corrupting familiar, magic. Contrast that to AD&D, where a high-level magic-user is unlikely to be bested unless he's confronted by an almost equal use of magic and where a warrior's or thief's inventory is likely to contain as many magical items as a wizard's, if not more. AS&SH's extensive chapters on AD&D-inspired spells and magic items contain no discussion of limiting magic for the sake of preserving the old-shool weird fantasy feel this game wants to be about. The original DMG at least contained warnings to the DM about what would happen if too much magic was set loose in the game. That warning wasn't just Gary spouting about his preferred style of play; it was motivated by the sacks of letters TSR received from DMs begging for advice after rampant magic torpedoed their campaigns--magic that was, in most cases, generated straight off the game's treasure and magic item tables. Since AS&SH's random treasure table is nearly identical to AD&D's, history leads us to expect it to generate the same Monte Haulish problems. Other games tackle this problem head-on. Crypts & Things admonishes the DM to keep magic items to a minimum, and all the sample items described in the book have serious drawbacks as well as advantages for their users. The power of C&T wizards is limited by penalties for casting destructive magic. Barbarians of Lemuria is not a retroclone by any stretch, but it achieves a strong pulp feel through carefully chosen rules that steer play along gritty, low-magic, pulpy paths. The only nod to limiting magic in AS&SH is that potions and scrolls alone can be manufactured by PCs. Everything else is a relic of a bygone era. In other words, you find it as treasure, which is exactly how countless AD&D campaigns soared into the magical stratosphere and suffocated there. Grafting AD&D's everything-and-the-kitchen-sink approach to spells and magic items onto Hypberborea is a disservice to the pulp-style setting. Of course, a DM can go through the AS&SH spells and magic item lists and cross off all the effects and items he wants his players never to get their hands on. I'd be fine with that approach if AS&SH was a generic fantasy game, but it's not. As it stands, Astonishing Swordsmen & Sorcerers of Hyperborea is the Odd Couple of FRPGs: two individually excellent products cohabiting the same box yet living in separate universes. If you're looking for a solid, approachable retroclone of AD&D, AS&SH is a strong choice. If you're looking for a weird fantasy setting inspired by the stories and ambiance of Howard, Leiber, Moorcock, and Smith, you won't find one much better than Hyperborea. But these two sharing an apartment? The linguini will hit the wall. I bought the PDF version, and I like the game, but your analysis is spot on. AS&SH is a great retro clone with some elements from sword and sorcery thrown in, but it isn't really a sword and sorcery game in the sense of the classic works that you sited. I still recommend the game though, great value for a complete OSR ruleset with some twist. I'm still looking for something between Barbarians of Lemuria and Mongoose Conan. Good review, Steve! I'll have to give some more thought to maintaining the lower-magic feel when I inject Hyperborea into my campaign. Great review Steve that for the most part nicely sums up my own thoughts about the game. For me, massively toning down the AD&D-style magic/magic item system would be necessary to achieve the "feel" that I want from the setting. I've only had a first look at the game so far, but the spells and items are also something I've been thinking about. I've already accepted that I have to create my own sorcery system for my own campaign, but it would have been nice to be surprised by ASSH in that regard.